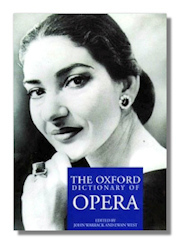 This list provides an overview of books addressing topics related to opera. Glossary, Black and white photos and illustrations. Short and medium length plot outlines. Premier dates and venues. Composers, biographical information, good indices, lists of contributors and brief works lists of libretticists, composers and lists of titles. (1304 pages). History of Opera (Norton/Grove Handbooks in Music), Stanley Sadie (Editor). W.W. Norton & Company. 1990. ISBN 0393028100 (hardcover). Handel's Operas, 1704-1726. Dean Winton & John Merrill Knapp. Boydell Press. 2009. ISBN 1843835258 (hardcover). 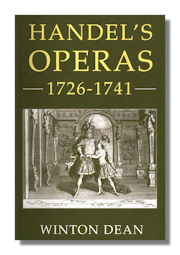 This first of the classic two-volume survey of Handel's operas was first published in 1987 and reissued in a revised paperback edition in 1995. Now it is brought back into print in a year which has seen numerous productions and recordings of the operas and which marks the 250th anniversary of Handel's death. Their revival in the modern theatre – not a single opera was staged or performed anywhere between 1754 and 1920 – has been among the most remarkable phenomena in the history of the art, and is due in no small measure to the painstaking research of Dean and Knapp in volume one, and Dean himself in volume two, published by Boydell in 2006. This first volume devotes a chapter to each of Handel's first seventeen operas, offering a full synopsis and study of the libretto, extensive discussions of the music, a performance history, and a comparison of the different versions of the opera. In addition there are several general chapters on the historical and stylistic context of Handel's operatic career to 1726, and a number of Appendices including a list of performances during Handel's life and the location of librettos, Handel's borrowings, Handel's singers, and modern stage productions up to the end of 1993. Read the Classical Net Review of this book. Handel's Operas, 1726-1741. Dean Winton. Boydell & Brewer Ltd. 2007. ISBN 1843832682 (hardcover). Handel ranks with Monteverdi, Mozart and Verdi among the supreme masters of opera, yet between 1754 (when Handel was still living) and 1920 not one of his operas was performed anywhere. Their revival in the modern theatre has been among the most remarkable phenomena in the history of the art. But they are still too little understood, or studied, and until recently no reliable modern editions existed. 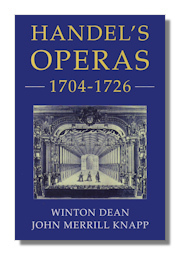 This long-awaited book is the sequel to Handel's Operas 1704-1726, published in 1987. It is the first study in depth of Handel's last twenty-two operas, including major masterpieces such as Orlando, Ariodante and Alcina and the brilliant lighter works Partenope, Serse and Imeneo. Each chapter contains a full synopsis and study of the libretto, a detailed assessment of the opera's musical and (often misunderstood) dramatic qualities, a performance history, and comparison of the different versions. Much new material has been incorporated. In addition four general chapters throw a vivid light on the historical background. Two Epilogues touch on Handel's dramatic vision, the revival of his operas in the twentieth century, and their performance today. There are a number of valuable Appendices. Together with its predecessor, the book provides the first complete overview of these works. Read the Classical Net Review of this book. The New Kobbe's Opera Book. Anthony Peattie, with Earl of Harewood. Putnam Publishing Group. December 1997. ISBN 0399143327 (hardcover). A comprehensive anthology of opera synopses and articles. 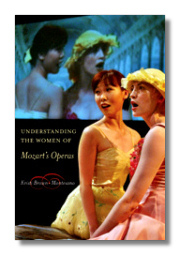 Understanding the Women of Mozart's Operas. Kristi Brown-Montesano. University of California Press. February 2007. ISBN 0520248023 (hardcover). Brown-Montesano, head of the music-history faculty at the Colburn Conservatory in Los Angeles, California, views each character as the subject of a story, not merely the object of a hero's narrative or the stock figure of convention. From amiable Zerlina, to the awesome Queen of the Night, to calculating Despina, all of Mozart's women have something unique to say. These readings also tackle provocative social, political, and cultural issues, which are used in the operas to define positive and negative images of femininity: revenge, power, seduction, resistance, autonomy, sacrifice, faithfulness, class, maternity, and sisterhood. Keenly aware of the historical gap between the origins of these works and contemporary culture, Brown-Montesano discusses how attitudes about such concepts – past and current – influence our appreciation of these fascinating representations of women. Phaidon Book of the Opera - A Survey of 780 Operas from 1597. Catherine Atthill. Phaidon Press. 1979. ISBN 0714818852 (paperback). Pfitzner's Palestrina. 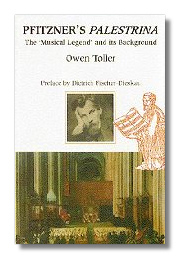 Owen Toller. Toccata Press. 1996. ISBN 0907689248 (hardcover). Long acknowledged in Germany as one of opera's outstanding achievements, Palestrina has been largely overlooked elsewhere. This thoroughly researched and approachably written book also considers the gestation of the work, discusses its historical background and tackles the thorny question of Pfitzner's relationship with the Nazis. Nineteenth-Century Italian Opera from Rossini to Puccini. Daniele Pistone. Amadeus Press. 1995. ISBN 0931340829 (hardcover). The Bel Canto Operas of Rossini, Donizetti and Bellini. Charles Osborne. Amadeus Press. 1995. ISBN 0931340845 (paperback). The author treats each of Rossini's 39 operas, Donizetti's 66, and Bellini's 10, discussing the libretto and the circumstances of each opera's first performance, outlining the plot, and ending with an analysis of the music. 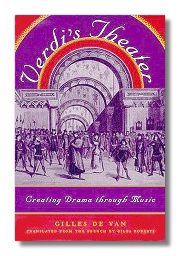 Verdi's Theater: Creating Drama Through Music. Gilles De Van, with Gilda Roberts (translator). University of Chicago Press. 1998. ISBN 0226143694 (hardcover), 0226143708 (paperback). In this innovative study, the author focuses on an often neglected aspect of Verdi's operas: their effectiveness as theater, arguing that two main aesthetic conceptions underlie all of Verdi's works: that of the "melodrama" and the "musical drama." In the melodrama the composer relies mainly on dramatic intensity and the rhythm linking various stages of the plot, using exemplary characters and situations. But in the musical drama reality begins to blur, the musical forms lose their excessively neat patterns, and doubt and ambiguity undermine characters and situations, reflecting the crisis of character typical of modernity. Although melodrama tends to dominate Verdi's early work and musical drama his later, both aesthetics are woven into all his operas: musical drama is already present in Ernani (1844), and melodrama is still present in Otello (1887). Indeed, much of the interest and originality of Verdi's operas lies in his adherence to both these contradictory systems, allowing the composer/dramatist to be simultaneously classical and modern, traditionalist and innovator. Opera in Italy Today: A Guide. Nick Rossi. Amadeus Press. 1995. ISBN 0931340772 (paperback). A panorama of Italy's operatic scene, describing not only Italy's major houses but also her regional theatres. Ten of the Italian opera festivals, including the Puccini, the Bellini, the Donizetti and the Rossini, are discussed. Opera in Paris, 1800-1850: A Lively History. Patrick Barbier, Robert Luoma (Translator). Amadeus Press. 1995. ISBN 0931340837 (hardcover). This book explores every facet pf Parisian musical life in the glorious first half of the 19th century. Among the composers who chose Paris as a second home were Rossini, Meyerbeer, Bellini, Donizetti, Liszt, and Chopin. Essays by Leontine Price, Lucciano Pavarotti, Rise Stevens, James Levine and many other famous Metropolitan Opera performers. Beautiful color photographs and black and white illustrations. Dictionary and biographical information, too. Saturday Afternoons at the Old Met: The Metropolitan Opera Broadcasts 1931-1950, Paul J. Jackson. Amadeus Press. 1992. ISBN 0931340489 (hardcover). Presents a rich and detailed history of the broadcasts at the The Metropolitan Opera in New York from their inception in 1931, when the imperious Gatti-Casazza ruled, on through the trouble regime of the more affable Edward Johnson. Sign-Off for the Old Met: The Metropolitan Opera Broadcasts 1950-1966, Paul Jackson. Amadeus Press. 1997. ISBN 1574670301 (hardcover). Last Look at the Old Met. Judith Clancy. Synergistic Press. 1969. ISBN 0912184108 (hardcover). Read about it in more detail (including excerpts from reviews) at www.synergisticbooks.com. Crosby's Opera House: Symbol of Chicago's Cultural Awakening. Eugene H. Cropsey. Fairleigh Dickinson University Press. 2000. ISBN 0838638228 (hardcover). In the context of Chicago's economic and cultural climate, social milieu, and the scramble for prominence and refinement among the newly rich, Eugene Cropsey presents an illuminating chronicle of the city's first great cultural awakening, with Crosby's Opera House as the central focus. It is also the story of Albert and Uranus Crosby, who migrated from Cape Cod to Chicago where, as successful entrepreneurs, they made their fortunes and later sacrificed it all in their efforts to bring a new musical and artistic enlightnment to their adopted city. The Crosbys' struggle to enhance the cultural climate out on the urban frontier of the 1860s was a turbulent one, vividly brought to life in this book through a gallery of colorful characters, including many of Chicago's prominent citizens, as well as the numerous impresarios, artists, musicians, and other entertainers who visited or settled in Chicago. 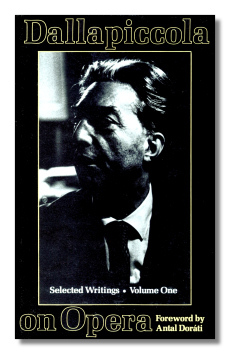 Selected Writings of Luigi Dallapiccola, Volume One: Dallapiccola On Opera. Luigi Dallapiccola, with Rudy Shackelford (Editor) and preface by Antál Doráti. Toccata Press. 1997. ISBN 0907689094 (hardcover), 0907689108 (paperback). Essays on the operas of Mozart, Verdi, Monteverdi, Wagner, Ravel, Busoni, Malipiero and, among others, Dallapiccola himself, by one of the twentieth century's leading composers. The Perfect Wagnerite. George Bernard Shaw. Dover Publications. 1967. ISBN 0486217078 (paperback). Shaw's entertaining allegorical interpretation of Wagner's Ring Cycle: Wagner as a revolutionist, Siegfried as Protestant. Wagner's Ring: A Listener's Companion & Concordance. J. K. Holman. Amadeus Press. 1997. ISBN 157467014X (hardcover). Wagner Without Fear: Learning to Love - And Even Enjoy - Opera's Most Demanding Genius. William Berger. Vintage Books. 1998. ISBN 0375700544 (paperback). 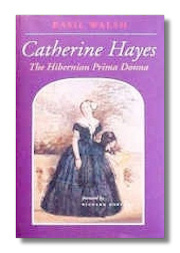 Catherine Hayes: The Hibernian Prima Donna. Basil Walsh, with Foreword by Conductor, Richard Bonynge. Irish Academic Press, Dublin & Portland OR.. September 2000. ISBN 071652662X (hardcover). This book details the life and times of Ireland's first great international female opera singer. It includes a chronology of her travels to 15 countries and performances, over a period of 30 years during the 19th century. Callas: Portrait of a Prima Donna. George Jellinek. Dover Publications. 1986. ISBN 0486250474 (paperback). The life and career of the legendary diva. 64 photographs. 416 pp. Lily Pons: A Centennial Portrait. Jame A. Drake, with Kristin Beall Ludecke. Amadeus Press. October 1999. ISBN 1574670476 (hardcover). 318 pp, 141 b/w photos. The Queen's Throat: Opera, Homosexuality, and the Mystery of Desire. Wayne Koestenbaum. Vintage Books. 1994. ISBN 0679749853 (paperback). This innovative, profound, and wildly playful book reveals the ways in which opera has served as a source of gay identity and gay personal style. The result is a learned, moving, and often very funny work of critical insight, subversion, and homage.